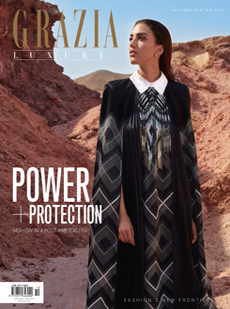 Grazia Luxury, is a biannual limited-edition magazine dedicated to keeping you in style, in the know and ahead of the curve. Through Grazia Luxury we aim to deliver exclusive interviews with the world's most-untouchable designers, take you behind the scenes with fashion's most-discerning celebrities and uncover the style secrets of the Middle East's most elusive sartorialists. Using Grazia's access-all-areas pass and flair for serious fashion to uncover even more luxury than ever before.